Recently I met up with a couple of online crafting friends in Mississippi (Hi Susan & Donna… miss you ladies already!!!) for a wonderful 3 day crop. My focus was mostly on Stampin’ Up!® projects and I will be sharing projects made from both the Magical Day and Sunshine and Rainbows Stamp & Die bundles. For someone who loves fantasy as well as all things colorful these were my first two sets purchased from the Spring Occasions Catalog. 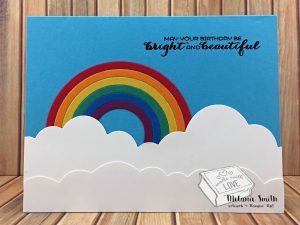 With this first sample I used the awesome dies with the Sunshine & Rainbow dies to create these clouds and rainbow. I just love how simple yet unique this is. The sentiment was from the same bundle. This second project incorporates both of the featured sets this week. Using the cloud dies I created a shaped card by trimming the upper left corner of a right opening card. 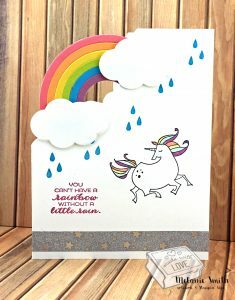 Then I was able to use the rainbow dies and clouds to connect it all together. This adorable unicorn and glitter washi tape came from the Magical Day Suite of products. Don’t these set work together nicely? Previous postHave Scraps??? Turn them into cards! Next postCAS Wednesday ~ Magical Mermaid!